In autism there is intellectual and behavioral disabilities. With autism the different areas of the brain fails to work together . In autism the child do not reach the developmental milestones like crawling, Saying the first word etc on time. They are generally slow learners or having low IQ. No two people with autism will have exactly same symptoms. Therefore autism also called as Spectrum Disorder. 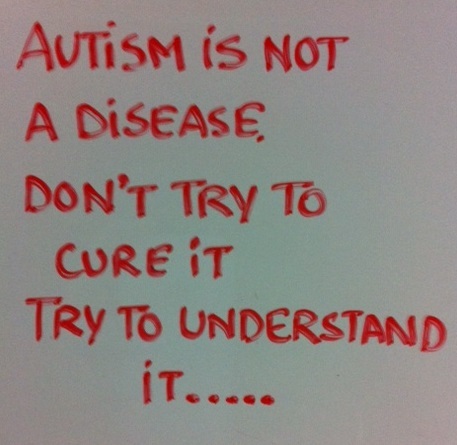 Autism is a neurological disorder but the cause is unknown. Genetic component indicates the strongest component but environmental , metabolic or immunological factors also lead to the development of disorder. There is no single gene responsible for autism, but there are different genes that combined together and increase the risk of autism. Autism tend to run in families, so may be related to inherit. d) neurological disorders affected after birth ( bacterial menengitis) . Other theories also plays an important role..
__ It is suggested that body’s immune system produce antibodies that attack the brains of children and lead to autism. __ Sometime abnormalities in brain structures also cause autistic behavior in children. __ Autistic children have abnormal timing of growth of their brains. In early childhood the brain grows faster and larger than the normal children, but later when normal children’s brain get bigger but autistic child brain grows slowly. __ There is no such evidence that shows vaccine can cause autism or any kind of behavioral disorder. Childhood vaccines cause autism especially measles mumps, rubella vaccine. Speculation is that a preservative used in vaccines, “Thimerosol” is responsible for increase in autism cases. __ Emotional trauma also plays an important role. It is believed that early age emotional trauma especially bad parents was blame but this theory was rejected.